My friend Eric who I hadn’t seen in a while planned a “Sunday Funday” for us. I picked him up and we went to the Eastern Market, a historic neighborhood near the Capital in DC. I had heard about the market, but had never been there. It was so much fun! There are three sections, an outdoor flea market in two areas and an indoor/outdoor food market that carries fresh seafood, meats, baked goods and more. It brought back memories of when I was little and my dad would take me to a flea market in my hometown on Sundays after church. He’d always let me pick out a treat for $5 or less. At one of the vendors that was a fair trade business Eric found some cool carved rings made out of animal horn. 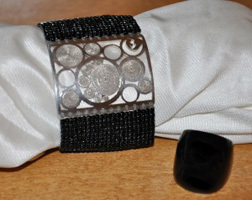 I found a similar ring and a pretty handmade cuff bracelet (in photo above). The items of course exceeded my dad’s old $5 limit, but I couldn’t resist. As a former artist, I’m a sucker for unique handmade goods. I can’t wait to go back to the market again in the spring! While we were walking around we stopped for some linner at Acqua Al 2. It’s the most authentic Italian restaurant I have eaten at in the more than 18 years I have lived in the area. The original location opened in 1978 in Florence, Italy. You can’t get much more genuine than that! We ate in the patio area outside filled with an eclectic mix of furniture. The bread was perfect, soft and fluffy in the middle with a crusty exterior and side of olive oil for dipping. As the main course I had Gnocchi with a delicious Gorgonzola Sauce — cooked perfectly and very flavorful. I took a business card so I wouldn’t forget the name of the restaurant. It looked like a matchbook, but I was pleasantly surprised to find a small packet of basil seeds inside. Very cool. I look forward to eating there again. The perfect fall afternoon with a dear friend.